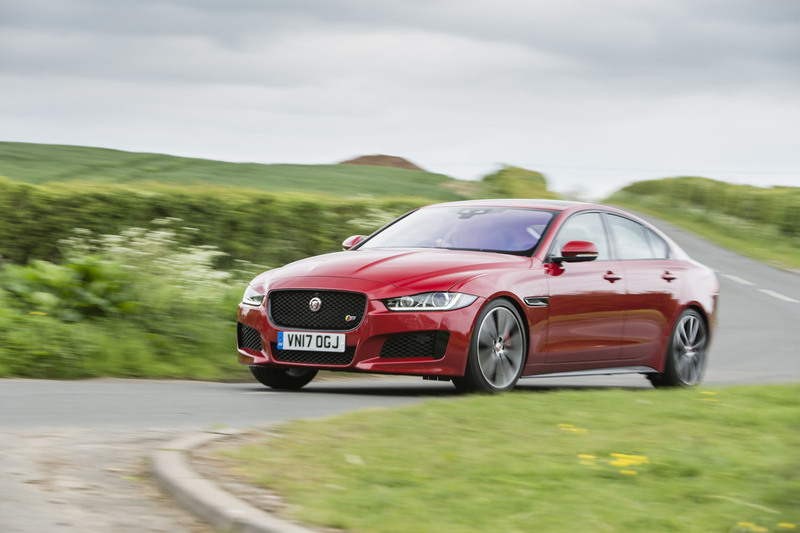 The good news is that the refreshed Jaguar XE S has retained all the character of the old car while gaining a decent shove of added performance. The bad news is…well, there isn’t much. We gave Jag’s performance saloon, which goes head to head with more cooking variants of the BMW 3 Series in the sub £55k sector, 4.5 stars when it had a measly 335bhp to play with. But now, its characterful supercharged V6 runs with the same specification as the most potent V6 F-Type, meaning output peaks at 375bhp. There are changes inside the cabin too, where Jaguar now offers its latest InControl Touch Pro infotainment system with a 12.3in TFT instrument display cluster and 10.1in touchscreen which gets dual pixel technology so you can view the sat-nav while your passengers watch a film. And more driver assist features are included, like a pedestrian detection function wth the car’s automatic emergency braking, blind spot assist and forward traffic detection systems. The 2017 car’s added 40bhp only trims a tenth from its 0-62mph time, bringing it down to 5.0sec dead, but the biggest benefit comes with the way the engine revs to its red line. The added oomph is all stored at the top, so you’re encouraged to hang onto the revs a little longer where the drivetrain also, pleasingly, makes the most exciting noises. Switch the eight-speed automatic into its Dynamic mode and you can keep the engine spinning in this aurally pleasing range using the paddle shifters, where it barks and crackles with excitement and bites into its rev limiter. It’s still not quite as racy as the F-Type, but I’d argue that this is the best sounding drivetrain in this category, as it feels significantly less synthesised than rivals. Like before, if you want to rein things in, the V6 will do just as good of a job at purring along as an effortless cruiser, with bags of torque available and a gearbox that’s quick to select the right cog. Jaguar claims that 34.9mpg combined is possible which is well short of diesel alternatives that can provide the same straight-line performance, but none of those can offer the breadth of personality this petrol unit can. Really, you have an engine with two personalities, something that rings true for the whole car actually. 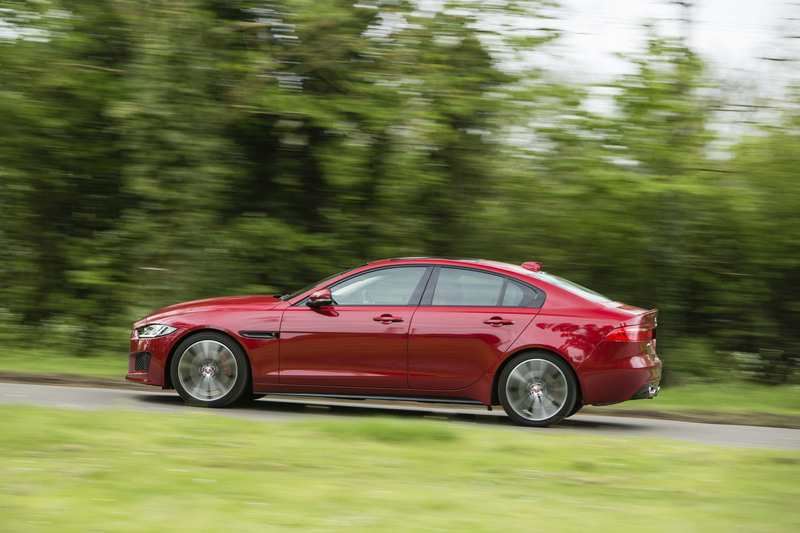 Jaguar’s configurable dynamics can now be specced on the XE S as a standalone feature, and it’s one well worth adding because it gives the chassis a heightened degree of flexibility. Switch things back to the softest mode and the car will competently soak up road imperfections and iron out speed bumps, but click across to the sports setting and the damping injects an agility and responsiveness into the chassis that makes the car feel significantly lighter on its toes than 1665kg suggests. The car uses torque vectoring by braking, and it’s noticeable if you power hard out of a corner while still applying steering lock. You can let the system make best use of the surface grip available and juggle torque to the back most effectively, but it doesn’t prevent you from being a hooligan and encouraging rear slip to dance the tail towards a bend’s outside. The whole car - engine, gearbox and chassis - feels so sweetly matched that you might think the XE S was the car Jaguar set out to build from the beginning, with the more important (in terms of sales) diesels and smaller petrol XE models adapted versions of this, rather than the other way around. With 375bhp to play with we’re not talking about a car that’ll destroy its tyres in two bends – that’s the segment above this and you’d need to another six or seven grand to reach it, not to mention the significantly ramped up running costs required to stay there. What we’re talking about is a well-balanced driver’s machine, a smartly judged sports saloon that can still carry five passengers and the weekly shop. Admittedly the 3 Series and Mercedes C-Class both offer more room inside, but the Jaguar’s uniqueness far outweighs those – from an Autocar perspective – comparably small gains. Anyway, you don’t buy an XE S because you want rear passengers to have the most legroom, you buy it because once you’ve dropped off those passengers you can go charging home the long way with the engine singing towards its red line, happy in the knowledge that this is the most engaging luxury saloon under £55k can buy. So how about a non biased (impossible perhaps as its a JLR product) conparison with a C43 Merc and an Infiniti Q50 3.0V6 400ps? There is an Alfa out there! To be fair there is no direct Giulia rival for this model - although prospective buyers would be mad not to try the QF before they buy. Nonetheless this XE does sound delightful. Why no 4WD? Strange when others are going to all wheel drive. S**t Interior Quality - PLEASE Listen Jaguar! WHY, why, why on god's green earth does Jaguar persist with such poor material and build quality with its all its entry and mid-range cars' interiors (especially in a £50k car like this one...)? The overall interior design may be visually pleasing, but everywhere you look there are AWFUL hard plastics, flimsy bits of trim and too small a selection of interior trims. Go to your local Jaguar dealer and see how much the centre console trim in an XE moves for example. The XE, XF and F-Pace are so close to being the perfect package - great looking, full of character and with fantastic ride and handling. A dose of Audi/BMW build quality and some Mercedes/Alfa Romeo flair in Jaguar interiors would unquestionably make cars like the XE S 5-star machines. I'd fall over myself to buy such a package. After all, people spend the most time with their cars driving in them, and it's nice to see and feel where your 50 grand has gone. Well said. You charge premium prices but the interior slush mouldings are just nowhere compared to Audi/BMW/Merc. Why can they not get the guys who do Range Rover interiors to sort this out. The first XF which I owned was far better than the new one. I mean you customer clinic these cars and you would have been told perceived quality does not match the germans...so get this sorted and then you will have the quality to go with the dynamics. As for this car.. I would rather wait for the 300bhp ingenium straight six than buy this. Where exactly are you looking for this paint blob/run? On the badge itself or on the body? Sorry Citytiger but I see no paint issues here. I think your looking at the reflection on the panel creases but definitely no blob or drip that I can see.